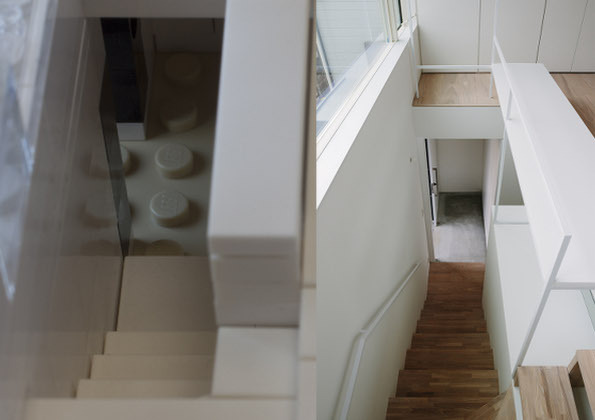 Japanese based architects studioLOOP was the inspiration for my newest Lego architecture creation. I was immediately drawn to the simplicity and economy of space of the design. Also, the plans are available on one of my favourite sites, ArchDaily. They also have a wonderful writeup of this house. I realised through other of my failed Lego architecture projects, that a regular 2 bedroom house use up a lot of Lego. I also realised that with all my Lego (the Architecture Studio and other loose bricks I added during the last couple of years) I can build a house that is about 70m² using the ratio that 1m = 2 studs. I still want to build a house that is minifig scale (1m = 3 studs) just to see how far my bricks will take me. I’ll keep you posted. Coming back to this project, here are some comparative photos taken by the very talented photographer, and my friend, Susan van Wyk.